The chapter uses electroencephalography (EEG) and functional magnetic resonance imaging (fMRI) evidence to explore neural bases of telicity/atelicity computation. 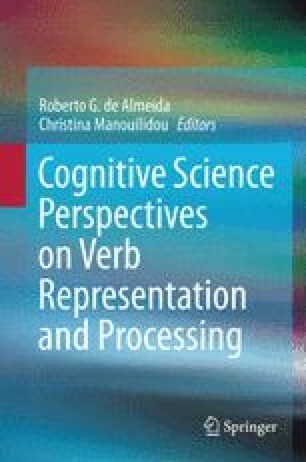 We focus on understanding how general language processing resources (e.g., working memory), as well as language-specific ones contribute to online computation of event structure from its distinctive features in spoken (English) and sign languages (e.g., American Sign Language, Croatian Sign Language). This work was partially supported by National Science Foundation Grant 0345314 to RBW, NIH DC00524 grant to RBW, NIH EB003990 grant to TMT, and Research Enhancement Program grant from the University of Texas at Arlington to EM.